Gerald of Wales, Giraldus Cambrensis, Gerald the Welshman, Gerallt Cymro, he is called: Master Gerald de Barry, Gerald the Marcher, Gerald the Archdeacon, Gerald Bishop-elect of St. Davids, he more often called himself. His many names reflect the long and multi-faceted career of one of the most fascinating figures of the Middle Ages. Descended from Norman Marcher barons, and Welsh princes, Gerald was by turns scholar, churchman and reformer, courtier, diplomat and would-be crusader; Marcher propagandist, agent of English kings, champion of the Welsh church, hunted outlaw and cathedral theologian. He was also a naturalist, gossip and indefatigable traveller, but above all a most prolific writer and a tireless self-publicist. From his seventeen surviving books, therefore, we know a great deal about this determined, irascible, self-righteous and utter fearless man; more, in fact, than about any other inhabitant of early medieval Wales. Because Gerald was endlessly curious, and almost obsessively anxious to record for posterity the things he discovered, his books also paint a remarkably detailed and wide-ranging picture of medieval Wales itself. Probably the most revealing is his Journey through Wales, an account of his eventful tour of the country with Archbishop Baldwin in 1188. He himself called this book, "a clear mirror, reflecting the wild and trackless places we passed through. It likewise names each spring and rushing river, and records our witty sayings, the hazards of the road, and the various accidents that befell us. It describes the landscape, and the notable things that have happened there both recently and a long time ago, with occasional digressions about natural wonders: and it portrays the country itself, as well as the origins, customs and ways of the inhabitants." A Mirror of Medieval Wales, Gerald of Wales and his Journey of 1188, by Charles Kightly, Cadw: Welsh Historic Monuments, 2 Fitzalan Road, Cardiff CF2 1UY, 1988. "So long as Wales shall stand by the writings of the Chroniclers and by songs of the Bards, shall Gerald's noble deeds be praised". "Many and great wars have we Welshman waged against the English, but none so great and fierce as his who fought the King and Archbishop, and withstood the might of the whole clergy and the people of England, for the honour of Wales". "Because I am a Welshman am I to be debarred from all preferments in Wales? On the same reasoning so would an Englishman in England, a Frenchman in France, and Italian in Italy. But I am sprung from the Princes of Wales and the Barons of the Marches, and when I see injustice in either race I hate it". Gerald Cambrensis, Gerald de Barri, Gerald the Welshman, the Archdeacon of Brecon and St. David's, Sylvestor the Wildman, Prebend of Hereford and Mathry,... these were all the names and titles for one of Wales' most famous sons. He was renowned in his own time and can still be found on school reading lists today. Indeed, one of the most enjoyable parts of any study of Welsh history will be the writings of Giraldus. But who was this character with so many professions and names? Gerald was one of the finest scholars of his day. In his lifespan of 77 years he excelled at many tasks. He was a priest, clerk and advisor on Welsh affairs to English kings, a lecturer on Civil and Canon Law at the University of Paris, travelling companion to Princes and Archbishops, and several times nominated as Bishop of St. David's. In spite of all of this, he found time to write at least 17 books. It is largely as an author that he is remembered today. However, he was more than that. Politics and Religion are often intertwined, and it was the political impact of Gerald's work for the Welsh church which was to impede his career. Gerald's father was a Norman knight, Sir William de Barri; his mother Angharad; the daughter of a Norman lord and a Welsh princess. Princess Nest, his grandmother, was known as the "Welsh Helen of Troy" due to her eventful love life. As a result of her marriages and amours Gerald was related to many of the Welsh princes as well as to the powerful Norman Geraldines. Yet from an early age Gerald wanted to be a priest. In his autobiography he says that while his brothers made sand castles on the beach he built churches. When the Welsh forces attacked nearby Tenby on a night in 1155, Gerald pleaded to leave the castle (Manorbier) and go to the church. In the excitement of the garrison being called to arms the boy's only concern was to be allowed to pray in sanctuary. By the time he was 13 years old his father and uncle, then the Bishop of St. David's, had taken to calling him "the little Bishop". Soon he was sent away to a monastery to begin his religious education early. Whilst Gerald's brothers became loyal Norman knights the young priest seems to have concentrated on his Welsh ancestry. He studied the history of the church in Wales and saw that it was suffering under Norman rule. Quoting legends of Celtic saints such as St. Sampson and St. David, Gerald claimed that St. David's had been independent of Canterbury, and that it deserved an Archbishop who could report directly to Rome. He campaigned to become Bishop of St. David's, and then Archbishop, and thus "restore the former dignities and privileges" of the Welsh church. Naturally his Welsh relatives were only too keen to see this done. A separate church was a vital part of their struggle for independence. "The King was very hot with anger and straightaway ordered that all the electors should have their lands confiscated." 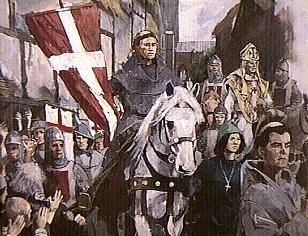 Henry declared that he had "no fear that any rebellion would be raised in Wales save by the Archdeacon (Gerald) alone". "It is neither necessary or expedient for king or archbishop that a man of great honesty or vigour should become Bishop of St. David's, for fear that the Crown and Canterbury should suffer thereby. Such and appointment would only give strength to the Welsh and increase their pride". Henry II put forward his own candidate, a Dutchman, who was duly elected in Gerald's place; and the canons were given back their lands when they accepted him. "By reason of the King's urgency, and also his promises and commands, I became a follower of the court and was of great assistance to keep the peace in Wales. None the less, on account of my kinship with the Lord Rhys ap Griffydd and other Welsh princes, I received from this King who had promoted and enriched so many an unworthy people, nothing except empty promises. Yet in private he praised me highly to his councellors, and said that but for my ties of blood he would have exalted me by granting ecclesiastical dignities and rich rewards, and would have made me a great man in his realm"." At court, Gerald also acted as chaplain and tutor to the princes who were to become King Richard I and King John. His trips to Wales on Crown matters allowed him to discuss long-held grievances with his Welsh relatives and to persuade the princes to support him if he was nominated as Bishop of St. David's again. This time he meant to take the matter as far as the Pope. With his sights firmly set on St. David's, he refused three other bishoprics which were offered to him. Events came to a head in 1198 when the Bishop of St. David's died. The Archbishop of Canterbury had become Gerald's enemy. Gerald had accused him of stockpiling arms and then selling them at a vast profit to Crusaders. Canterbury nominated two candidates, but the canons of St. David's refused them. They sent a deputation to King John to plead for Gerald as bishop. John praised his old tutor and wrote letters accepting the nomination. Gerald was then unanimously elected as Bishop of St. David's for the second time. Gerald rushed to Rome across war-torn Europe to be consecrated by the Pope. On meeting Innocent III Gerald declared "Others will offer you bribes, but I bring only books". He then presented the pontiff with copies of his six books. The war delayed news from England and Gerald settled down to a long stay at the Vatican. The Pope kept the books as bedside reading and quoted pithy passages to his Cardinals. But those first words were prophetic. Letters arrived from Canterbury which smeared Gerald's name and claims. As usual, King John had been persuaded to change his mind. Higher financial gains were offered to both the King and Pope. All Gerald had were legends, books and the promised tithes (church taxes) of a small country like Wales. He hung on in Rome until the Pope ordered a commission to try the election and examine the claims for St. David's. Gerald was to remain as administrator of the diocese, but when he returned from Wales he found the chapter afraid of any further dissent. Court edicts were issued against Gerald which meant that for him to pursue his case he would have been in open rebellion. He tried to rally support, but found that only one old woman in St. David's would even speak to him. She said, "There are many good men and true in St. David's who are sorrowful today because the dare not fight for you as they should". Armed with new documents from the archives at St. David's Gerald went to north Wales and won the support of the princes and general populace. He hid from his enemies on the English coast for days until he found a boat to take him across the channel. He was robbed on the continent and had to cross the Alps in winter. When he finally arrived in Rome emissaries from Canterbury were waiting for him. The debate raged before the Pope, another commission was ordered, and Gerald left Rome heavily in debt. To cap it all he was captured and imprisoned in France for being a subject of King John! He convinced them he was not a spy, but by the time he got back to St. David's the matter was already decided against him. Gerald's struggle had lasted five years and took its toll. Once a tall, handsome and dashing figure, a friend described him on his second return from Rome as resembling "a scarecrow with bushy eyebrows". He passed all his titles and holdings to his nephew, who repaid the kindness by openly criticizing Gerald's campaign. He retired to a monastery, where he longed for a life of peace, prayer and contemplation. But even now he was driven to write further books. He "Kept vigil to dawn, working by candlelight, turning night into day, writing treatises and histories, as though back at University where nothing mattered save study". In the face of his lost cause Gerald was neither a fool or a coward. It was remarkable that he managed to live to an old age and die in bed. A couple of his later books give us a clue why. He was to admit that his claim for St. David's was based on legend, but this was simply stating the obvious. He also wrote as if he had become Gerald the Churchman, or Norman, rather than Gerald of Wales. But the fire never really went out. He asked to be buried in his beloved St. David's. Tradition has it that one of the effigies in the cathedral is his, but no one has been able to prove which. It may well be that he was not even allowed to lie there in death. His eulogy came from the Welsh princes and bards, not from the Church or Crown.